Turkey’s President Recep Tayyip Erdogan claimed victory in critical presidential and parliamentary elections on Sunday. The vote grants him five more years in office as well as unprecedented powers in a powerful presidential system. His critics had hoped that this time they had a real shot at defeating the strongman. The notoriously fractured opposition had united to deny the ruling party a parliamentary majority. The main opposition, the Republican People’s Party (CHP), had fielded a firebrand candidate who was determined to reach out well beyond the party’s secularist, nationalist base. His rallies drew vast crowds. The newly founded Iyi Party that split with Erdogan’s nationalist ally, the Nationalist Movement Party (MHP), looked set to draw votes away from Erdogan’s Justice and Development Party (AKP). The opposition parties were running energetic campaigns while Erdogan was stumbling in rallies. Concerns over the economy and a plunging currency were mounting. For the first time in many years, the opposition had hopes. They were crushed yesterday. Erdogan captured 52 percent of the popular vote. The main opposition party’s presidential candidate, who captured 30 percent, conceded defeat. The ruling AKP saw a 7 percent drop in its support but can maintain a parliamentary majority with the help of the MHP, which polled much better than expected at 11 percent. The main opposition CHP fared badly with a 3 percent drop in its votes compared to the 2015 elections. The pro-Kurdish Peoples’ Democratic Party (HDP) and the nationalist Iyi Party passed the 10 percent threshold and entered the parliament. The Islamist Felicity Party, however, performed poorly, crushing expectations that the party would eat into the AKP’s base. Now the question many in the opposition ask is: how did it come to this? For the first time in the country’s history, Turkish voters cast their ballots simultaneously in the parliamentary and presidential elections. This system paved the way for strategic voting. Most AKP voters seem to have voted for Erdogan for the presidency. But the drop in the AKP’s votes suggests those who have been uncomfortable with Erdogan’s policies voted for the MHP, which explains the increase in MHP votes at a time when the party lost ground to Iyi Party. The loss in the CHP’s votes suggests some CHP voters voted for the pro-Kurdish HDP to help the party pass the 10 percent threshold. The nationalist Iyi Party seems to have secured votes from some CHP voters who support a tougher stance against the Kurds. Despite the tactical votes, the big picture tells us that Turkish politics remain trapped in identity politics. The CHP remains the party of the educated, the secular, and the economically well-developed coastal regions. The religiously conservative, nationalist central Anatolian heartland remains the AKP’s and MHP’s stronghold. The pro-Kurdish HDP leads in the Kurdish region. There is little volatility among these blocs. The main opposition’s candidate tried hard to shatter his party’s image as an anti-religious, nationalist party. He took off his party badge and vowed that he would be “everyone’s president.” He reached out to the Kurds, promised reforms to address the Kurdish question if elected, and assured the religiously conservative that he would not interfere with their headscarves. But he was not convincing enough for those disillusioned AKP supporters who have voted for Erdogan and enjoyed religious freedoms under his rule. They turned to a safer bet, the MHP, to signal their frustration rather than voting for a party that they still see as the bastion of radical secularism. Despite the role identity politics played in voter behavior, Erdogan’s victory is not the victory of Islamism either. The Islamist Felicity Party polled very poorly in the elections. It was rather a mix of Turkish nationalism and religious conservatism along with enduring hope that Erdogan will still deliver economically that gave him the victory. Now the question is: what comes next? 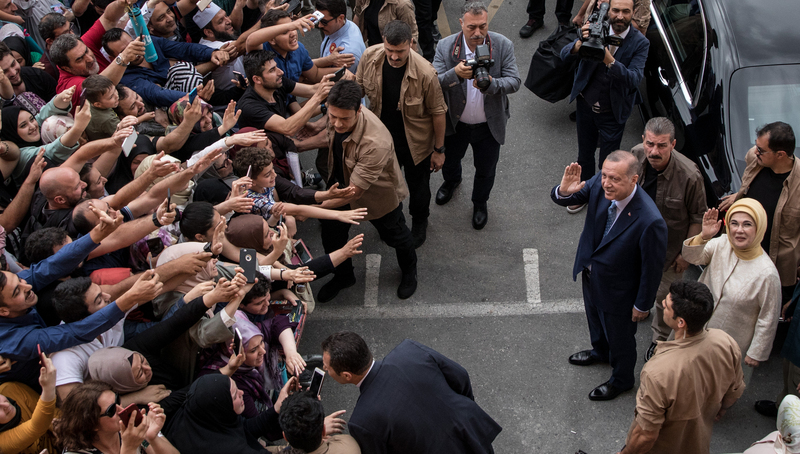 For the other half that did not vote for Erdogan or the ruling party, these elections marked the last exit before the country becomes a full-fledged authoritarian regime. Yet, there might be a glimmer of hope. Erdogan’s ruling party relies on the support of the MHP to maintain a majority in the parliament. That might not bode well for resolving the country’s Kurdish question or putting the country’s democracy back on track. But the MHP’s support should not be taken for granted when it comes to economy. If Turkey’s economic woes worsen, the alliance with the MHP might crumble and the parliament could play a role in counterbalancing Erdogan. But until then, expect more of what we have seen since 2015: polarization along ethnic lines, anti-Western rhetoric, and a hawkish Kurdish policy both at home and in the region.